Contact us anytime through our 24/7 support. Send us your feedback and suggestions. 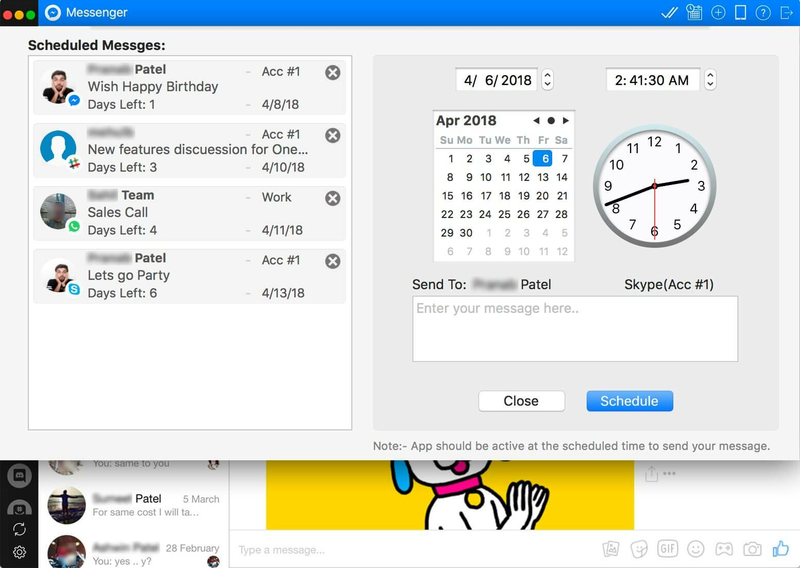 You can schedule messages at predetermined date and time. This is very useful when you have lots of friends and customers. 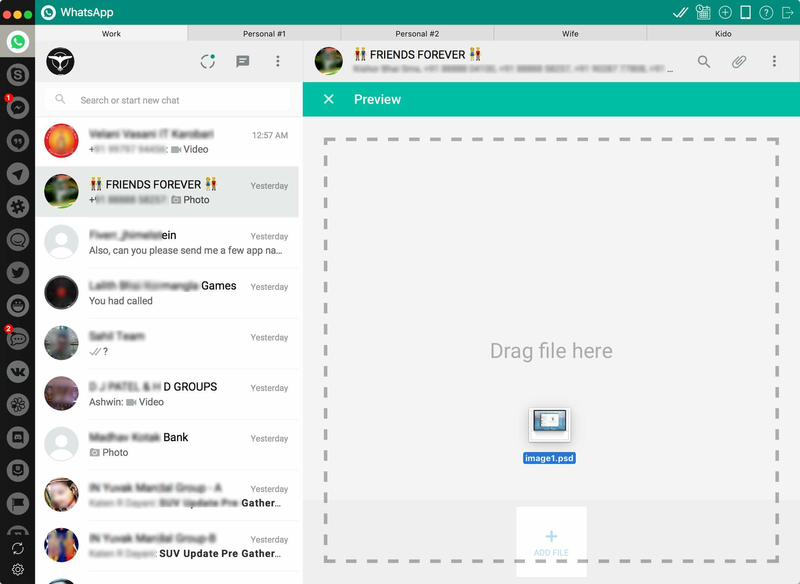 You can send and receive photos, images, videos, and documents in several formats by using the highly user-friendly drag/drop/attach option. I’ve been using OneChat for quite a while now and I’ve been impressed with how each version has gotten better. OneChat supports services I don’t use, but if I have reason to use them, I’m really glad they are there. Having more than I need isn’t a problem, because If I don’t have an account set up, they don’t appear. I strongly recommend this app. It just gets substantially better with each release. Got sick of running a half dozen browser tabs for messaging apps. This collects everything in one simple interface. And yes technically this is just an aggregator of the various web front ends etc, but its worth it if you are drowning in messengers/chat apps, it keeps everything simple, consistent, and contained and that is absolutely worth the cost of entry for me. A program that combines many messengers and assigns them in a meaningful way. The app works fast easy and reliable. So far I have found no point to criticism. (Which is very good) Of course there are still some wishes. IMessage for example. The price is not exactly a snapper. :-) I certainly do not regret buying this app. I'm looking forward to the new version and what it brings. 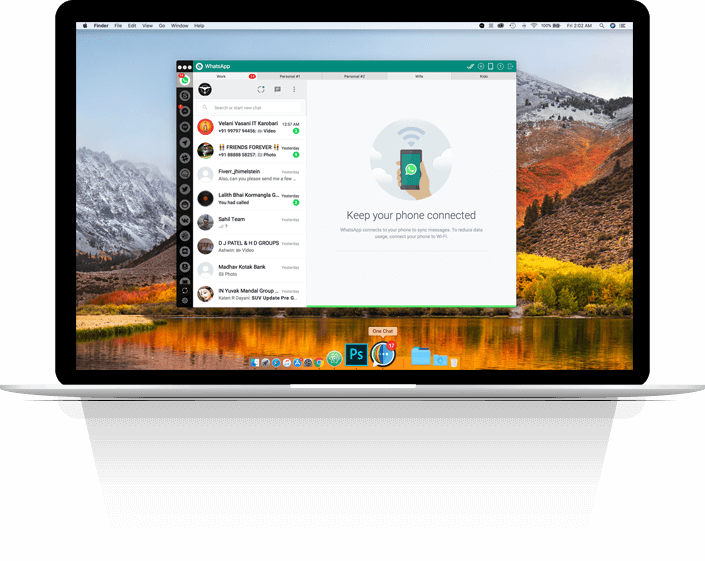 Say goodbye to opening multiple tabs on your PC to manage your messaging services. 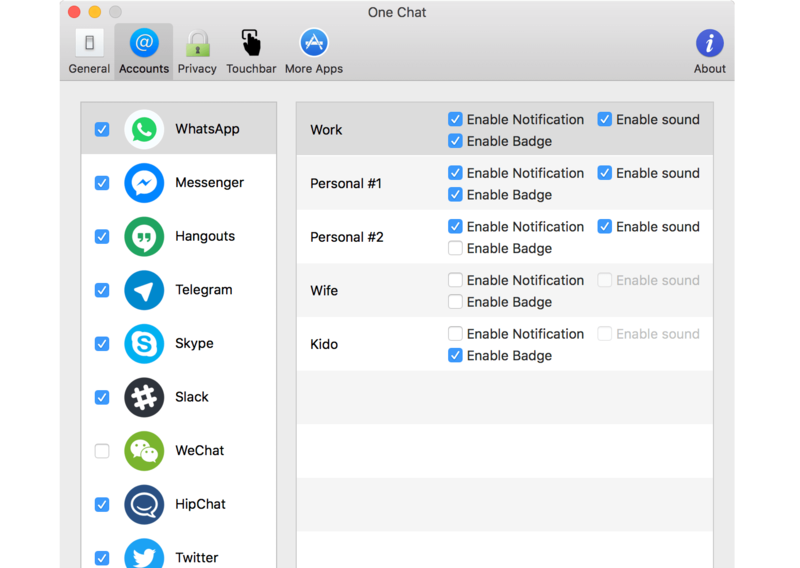 OneChat takes the tardiness out of the equation while managing the different messaging services individually. You can control all of them from OneChat service. You can use OneChat effortlessly for both personal and business use. How to add more messaging services? You can add any number of messaging services from the ‘Settings’ tab. Once you click on the tab, you will see all the messaging services from which you can select the ones you want to use. Does One Chat stores my credentials? No, it isn't store any credentials, That a feature we are planning for future versions with Single Sign One. Definitely. We don't keep your private information anywhere! Can I use One Chat on Multiple computers? How many messaging services are supported? One Chat provides the listed core messaging services on the website. You can see all of them here. If the app you want to add is not on the list, you can contact us by sending an email to support@appyogi.com. We will endeavor to add the service to you. How many messaging services can I add to One Chat? There is no limit to the number of messaging services you want to add. In fact, you can even add multiple accounts of the same messaging service. Is One Chat open source? No, OneChat is not open source. We have consciously decided against open source because we perceive it to be a security risk. We want to protect your information and we think that open source carries an element of risk. New services and features to integrate? Subscribe to our newsletter to receive update & latest feature news. 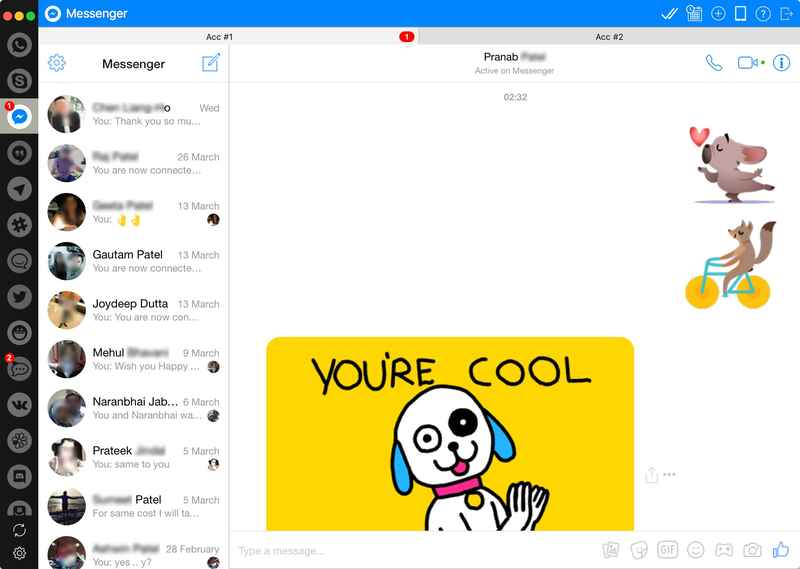 Copyright © 2019 OneChat Messenger. All Rights Reserved.